to talk about KNITTING. The planets have aligned. All cosmic forces are lined up. Go out and buy a lottery ticket. The Phillies are hosting a Stitch N Pitch Night on Tuesday, June 26. Knitters, crocheters, needlepointers, and cross-stitchers are all invited to come out to the park and wield their needles. I was invited to be on the Organizing Committee. 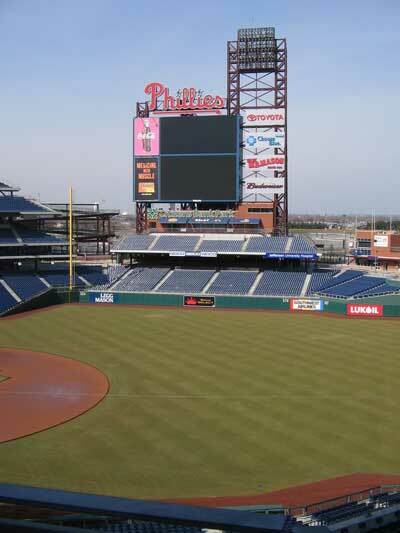 So I spent the morning at Citizens Bank Park talking with representatives from the Phillies about organizing the event. Okay, how demented is THAT??!!! I'm still reeling. The ironic part is that, though I knit while waiting at doctors' offices or in line at the bank or while waiting to pick up Gus or at red lights or at any other moment I can think of, I never knit at the ballpark. This is because I keep score, and scoring came first with me before knitting. I was chatting with the representative from TNNA (National Needlearts Assoc.) from San Francisco and mentioned that I never knit at games because I keep score, and she said, "For both teams?" Huh? What a weird question. I said, "Uh, yes." and she said, "Oh I only keep score when the Giants are up." What's up with that? What's the point of keeping score if you only do it for half the game? Oh well, not to worry. Let's just revel in the pure cosmic goodness of the moment. One of the only places I do not KIP is at basketball games. Frankly, I am too involved in the game. There's no scoring, but there is too much jumping up and down and flailing about! btw, how did you like the Palestra?? EPP - I'll see your Zito and raise you a Freddy Garcia.